Twenty-two years ago, I was a bright-eyed, idealistic university student learning Spanish and biology in Ecuador. 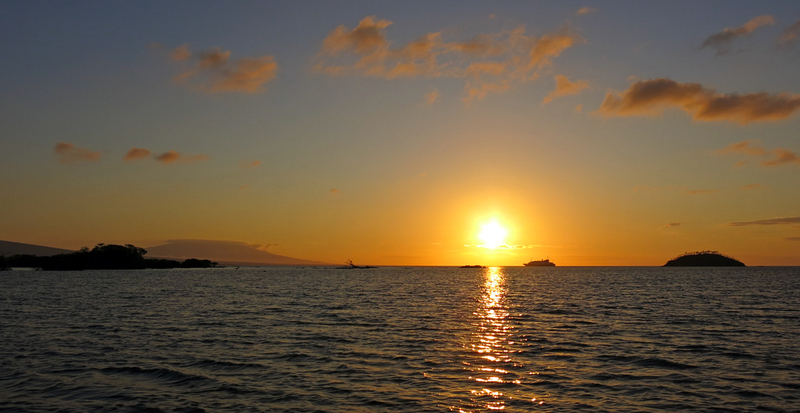 As part of the comparative ecology program I was undertaking in this phenomenal country, I had the opportunity to study for eight days in the Galapagos Islands, 600 miles offshore of the mainland, living on a small boat and cruising from island to island. The experience changed my life. It helped me to realize that I wanted to be warm, and outdoors, and studying my subject first hand on a daily basis. I also realized that I had the opportunity to share my understanding with willing students as a naturalist. 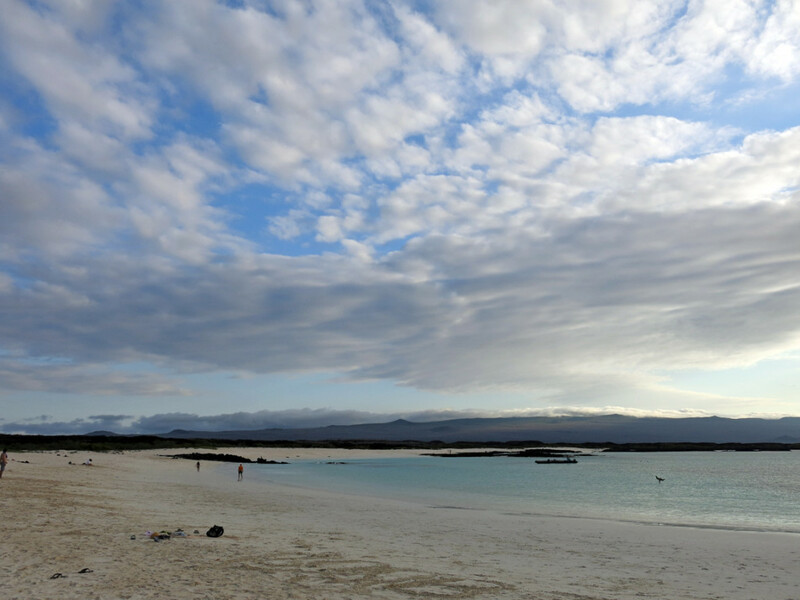 Iconic Galapagos landscape. Somewhere I have a shot from the same spot 22 years earlier. 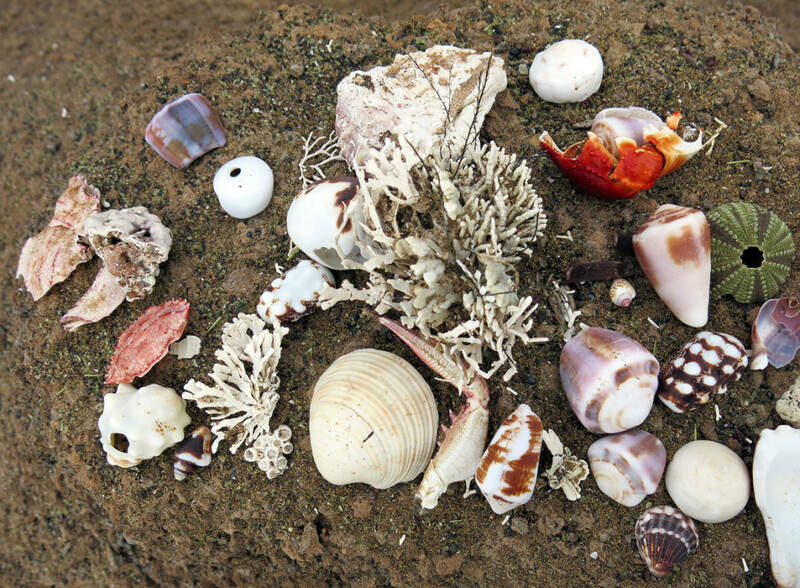 And so, it was a great privilege to return to the islands last month at such a different point in my life, but essentially living out my Galapagos fueled dream of traveling the world’s oceans and sharing my oceanic insights one-by-one. 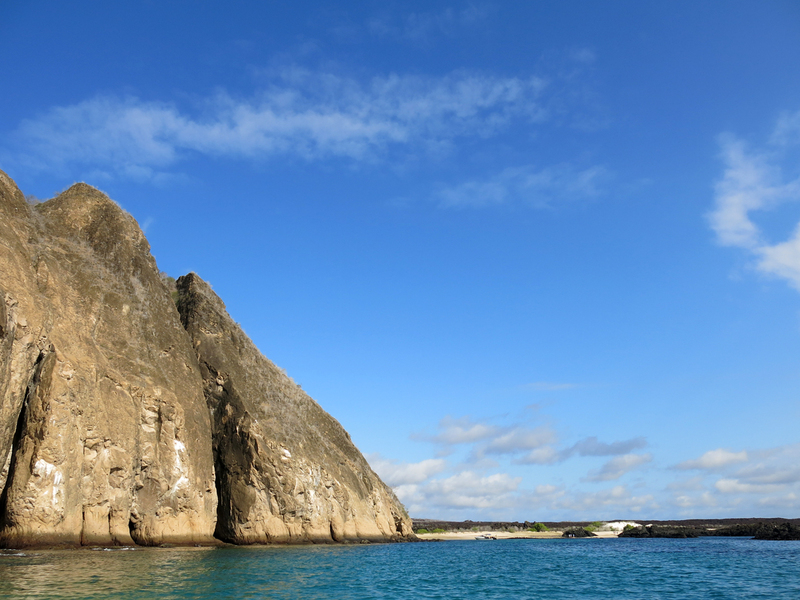 San Cristobal Island in the sun heading to one of my favorite beaches anywhere. Clear water breaking on the rocks at Plaza Sur looks like it belongs in the heart of an aquamarine gemstone. Desert cactus stand like sentinels planted in a red carpet of succulents. A swing of the head and I’m looking at an electric blue bay with organic white beaches and in the distance, long, gently sloping volcanoes. 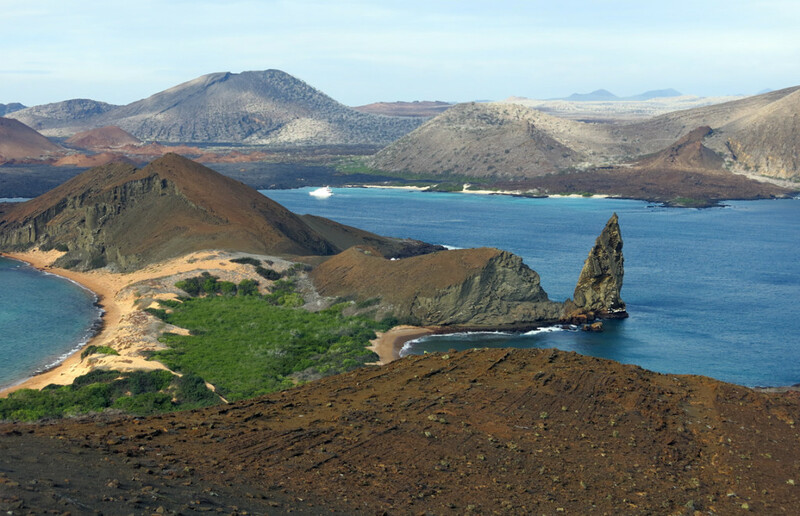 There is little green except for the cactus on top of volcanic rock full of chocolate bar bubbles. 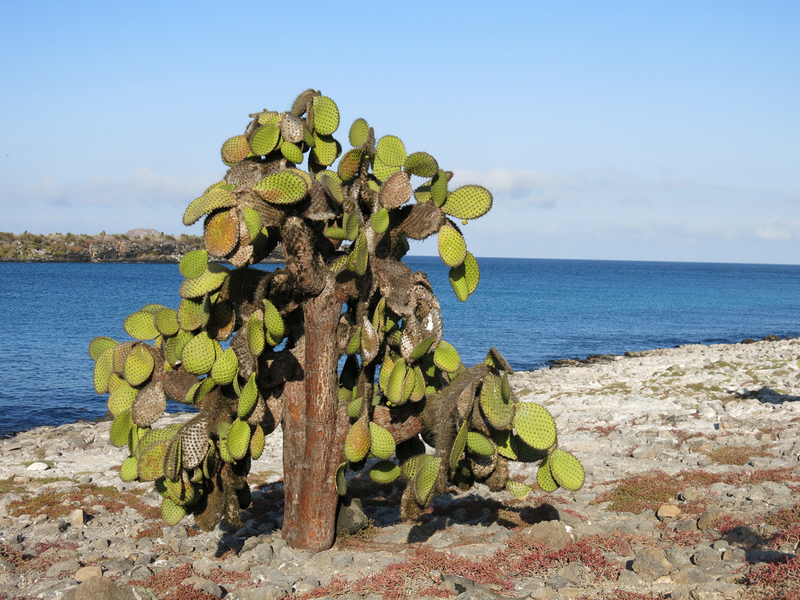 A Prickly Pear Cactus tree picks up the late day rays of sunlight over Plaza Sur. Bright red and orange crabs hang on the astronomically black rocks, next to cobalt blue water. 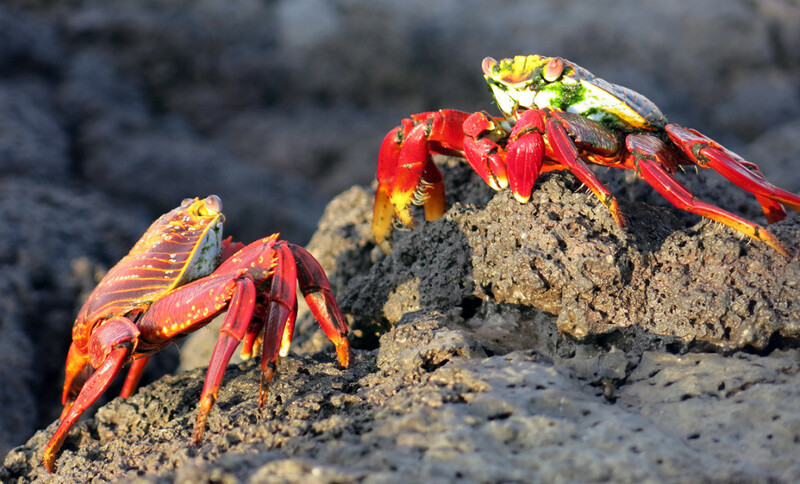 Sally Lightfoot Crabs size each other up on the shoreline. Frigate birds fly past at eye level as I stand on the cliff’s edge. Struggling against the powerful wind, the birds are nearly stationary and hover with wings spread wide, forked tails wide open, and eyes boring into your own. 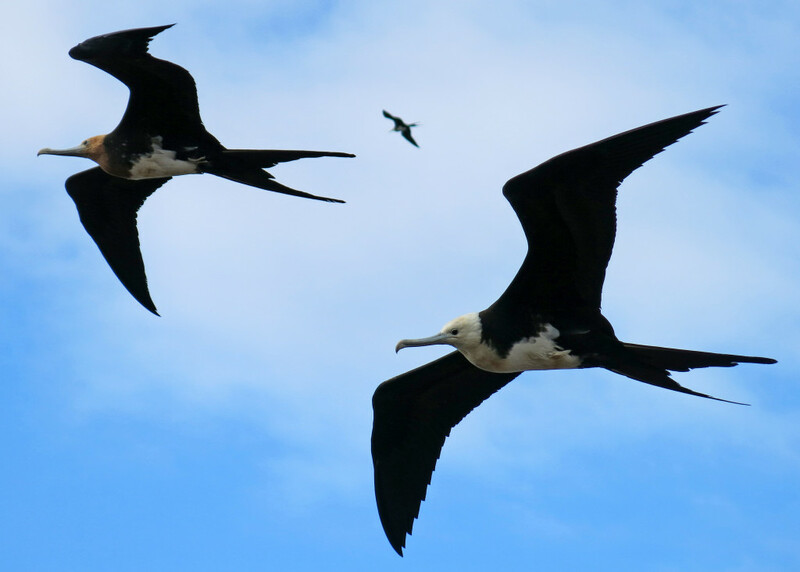 Juvenile frigate birds coast just over my head in the stiff wind. 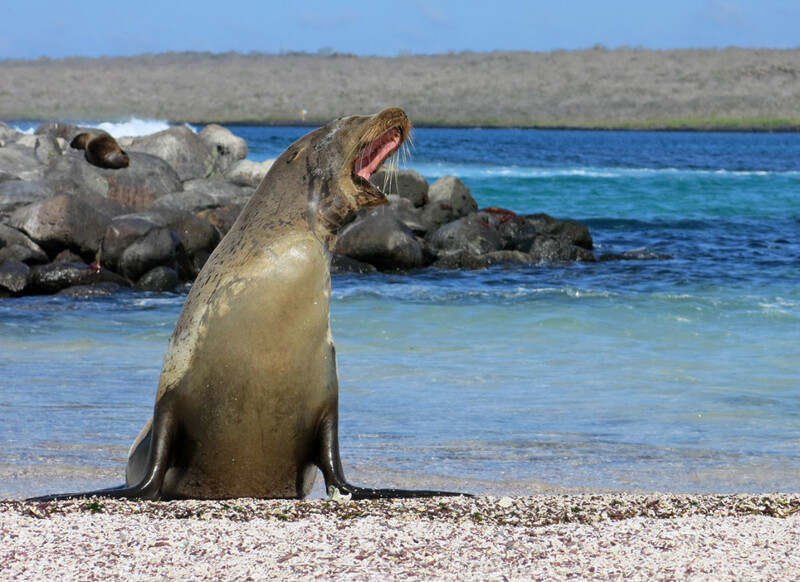 Galapagos sea Lions with silken bodies wave through the water like a banner in the wind. The pups, mothers, aunts and other female relatives are close and affectionate with each other. They seem to kiss in greeting and at other times cry out and hide a softly folded face against a jagged volcanic rock in an expression of emotion left open to interpretation. 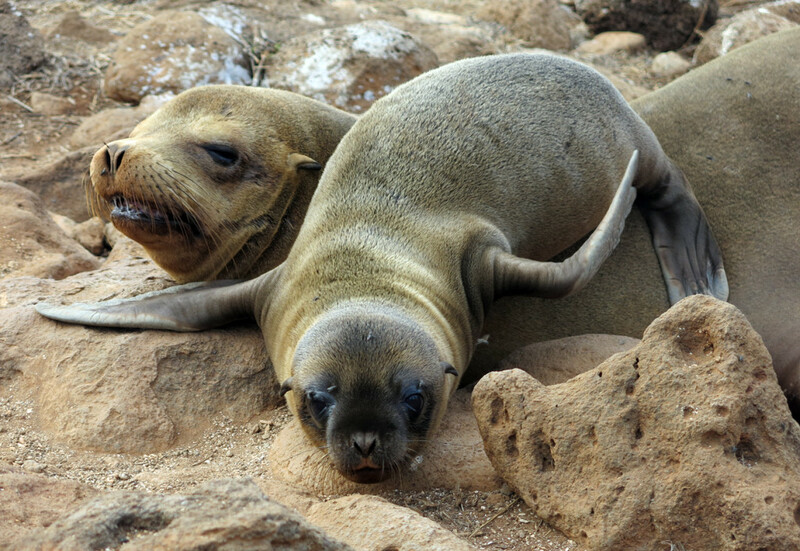 A mother Galapagos Sea Lion and her pup rest ashore for a spell. I swim with sea lions, or as they are known in Spanish; Lobos del Mar – literally ‘sea wolves.’ As they twist around me and float by upside-down without effort, one will swim toward me and at the last moment before impact, somersault away, back-flipping in jest and no doubt enjoying the reaction the behaviors elicit in me. 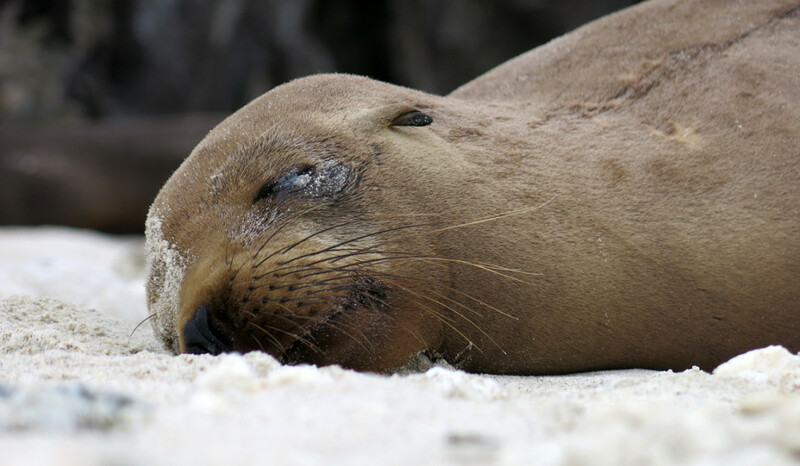 The sea lions lay around ashore looking like hung-over college students on a Sunday morning. It’s 10 am and no one is in any rush to wake up. I watched a pup alone in the surf. I watched the waves break over him and toss him around and there wasn’t anything I could do to help. A young sea lion rests exhausted on the sand. 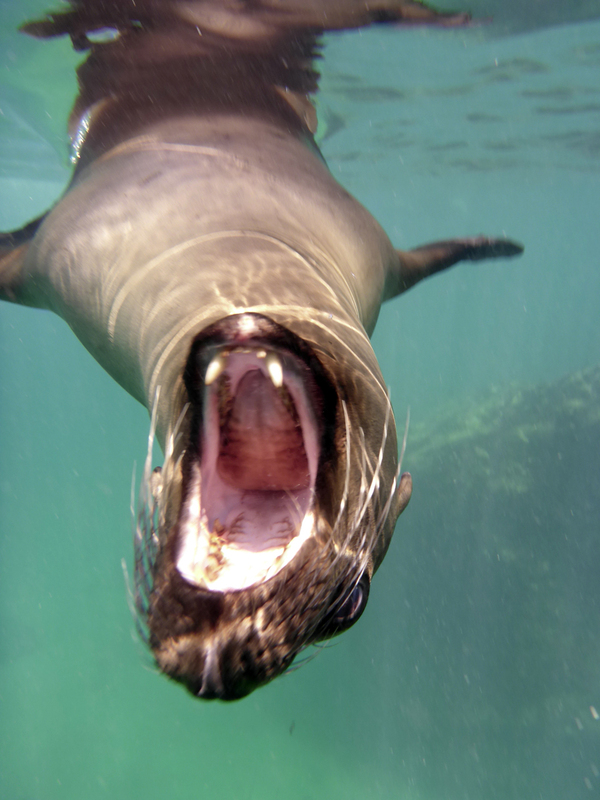 A noisy sea lion barks noisely on the shoreline. I don’t think I’ve ever been so at peace. It takes no energy to concentrate my thoughts on the here and now – on the moment. 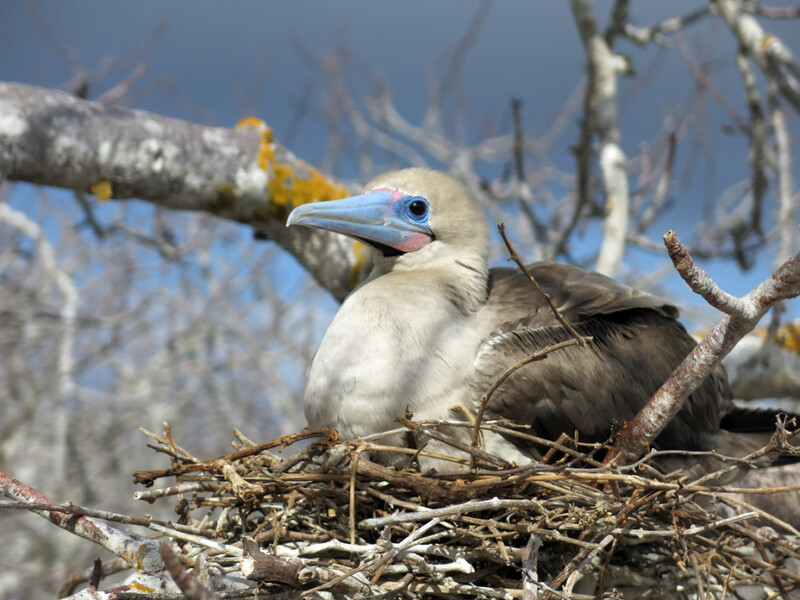 Wildlife, like this Red-footed Booby, is fearless. Completely without fear. 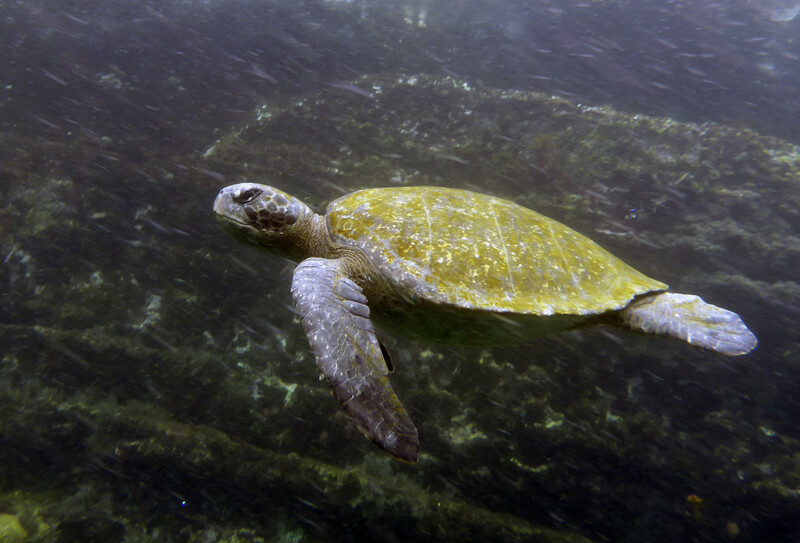 A large Pacific Green Turtle cuts through the cool coastal waters of the islands. Last night I jumped off the roof of the boat at anchor. I leapt into the clear, green water and into the night. I could see rays and sea lions swimming all around me in the ring of the ship’s spotlight. 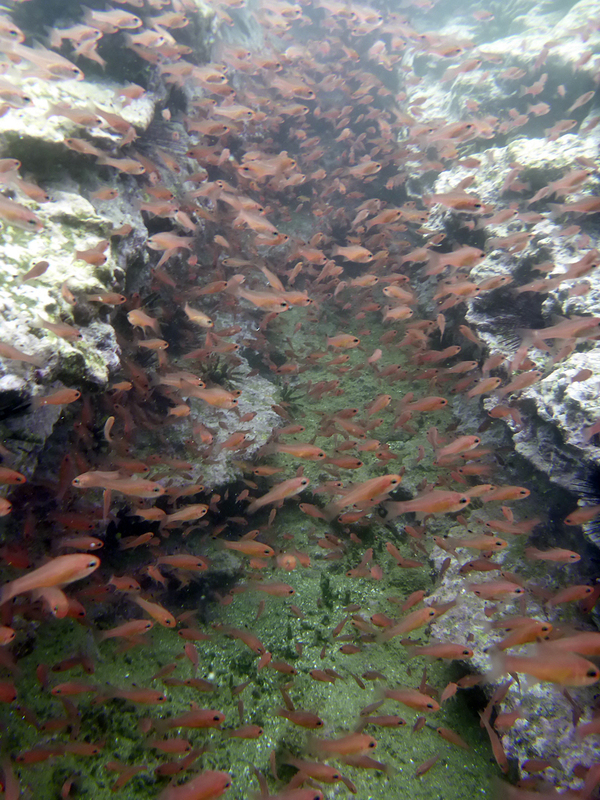 Schools of fish from small like these to massive whale sharks also cruise the Galapagos.